Episode 5 of Ristorante Paradiso, “Taste of Orsini”, starts with GiGi visiting a cemetery to pay his respects to a particular grave with a 1982 bottle of Orsini wine, where a young woman strikes up a conversation with him after having seen him regularly at the same cemetery before. As usual for GiGi, the conversation is rather one-sided with GiGi not saying anything. After the opening sequence, Olga is very much looking forward to a special guest at the restaurant, a handsome gentleman with reading glasses. While Olga is in fangirl mode, Nicoletta is exasperated with her mother’s gentleman mania, which is when she’s set on the task of getting food to Lorenzo. She gets the desire to learn more about him, especially why he fell in love with Olga. As GiGi fills the wine glass for Lorenzo, Nicoletta also thinks that she’s never had the chance to really talk with GiGi. She does get to learn a bit more about GiGi when Olga shows her how GiGi has an uncanny to select the best wine for a particular guest. When Nicoletta heads back to Lorenzo to retrieve a plate, she notices GiGi pouring wine for Lorenzo despite not having kept an eye on the owner. Lorenzo realizes what Nicoletta is thinking and explains that he and GiGi have been together for a long time, pointing out a picture from 27 years ago, taken when Lorenzo and his big brother opened a restaurant next to the winery. Nicoletta knew that Lorenzo manages a winery, but it’s a big surprise for her to learn that GiGi is Lorenzo’s big brother. It turns out that Lorenzo and GiGi are half-brothers, although Nicoletta is surprised to learn that they first met when Lorenzo was 23 years old. Their first encounter happened at a wine gathering where GiGi handed Lorenzo a business card, introducing himself as a sommelier. By the way, GiGi’s full name is Gian Luigi Orsini. Lorenzo realized that this was his big brother and revealed as much, and GiGi’s reaction was to leave, stating that his father had forbidden contact with Lorenzo. Nicoletta learns that this is because Lorenzo’s father had stolen away his older brother’s wife, so it’s no surprise that GiGi’s father would hate the guts of Lorenzo’s father. Lorenzo’s father was not so antagonistic in turn, and in fact was quite accepting of GiGi. When Lorenzo went to check out the restaurant where GiGi worked as a sommelier, his father had him pass on an invitation for GiGi to come to the winery whenever he liked. Having received a friendly reception from Lorenzo and Lorenzo’s father at the winery they operated, and also liking the winery itself, GiGi became a regular visitor to the winery and grew to be close with Lorenzo. Eventually, Lorenzo asked GiGi to help out with the wine list for the new restaurant that he and his father were opening. However, Lorenzo’s father went ballistic upon learning that GiGi was helping out Lorenzo and his father. He got even angrier when GiGi said that he was going to work at the new restaurant, stating that his father’s grudge really had nothing to do with the GiGi and Lorenzo. Unfortunately, this caused a heart attack and GiGi’s father died, and GiGi turned himself in to the police claiming that he killed his father. The police are not stupid enough to charge GiGi for anything, although they did indulge him by booking him for a night, after which Lorenzo arrived to take him home. A year later, Lorenzo and GiGi would together open the restaurant that would be the precursor to the casetta dell’orso. Later that night as the restaurant closes, Nicoletta thinks back to what she learned about Lorenzo and GiGi, realizing the reason why Lorenzo disliked divorce: he didn’t like how it came between himself and his own half-brother. GiGi offers a glass of 1982 Orsini wine, pointing out that it’s from the same year as when Lorenzo and he opened a restaurant. 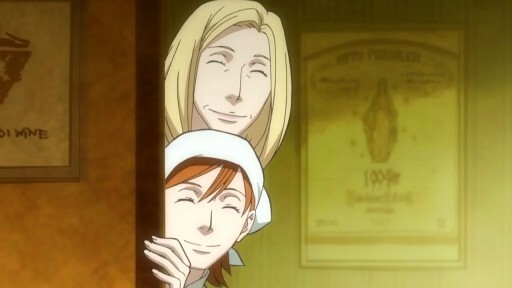 But when Nicoletta complains about Olga being so cheerful, GiGi points out that Olga is Nicoletta’s mother. Nicoletta doubts that Claudio would have revealed her secret, and she would be right: GiGi points out that Nicoletta and Olga have the same smile. And Nicoletta realizes that GiGi watches those close to him properly as he pours a glass of wine for Olga, seeing how he offers the right wine at the right time. At the end of the episode, we see GiGi going to his father’s grave to pay his respects, when he notices a marriage ceremony for the woman from the beginning of the episode. The woman apologizes that she won’t be able to see GiGi as often since she will be living in another city and worries if she would be a bad daughter for not visiting her father’s grave as often as she did. GiGi says the right thing at the right time by pointing out how happy her father must be as he watches her from heaven. This episode is all about Lorenzo and especially GiGi. Nicoletta must have learned far more about the two than she was expecting at the beginning of the episode. We know that GiGi’s father is dead, as well as the mother of Lorenzo and GiGi, but I wonder if Lorenzo’s father is still around. GiGi might not show much outwardly, but he turns out to be quite the sensitive person on the inside. He even noticed that Nicoletta and Olga were daughter and mother from their smiles, something Claudio missed back in episode 2 despite the obvious resemblance. I wouldn’t be surprised if GiGi’s half-brother Lorenzo also has an inkling of their relationship.